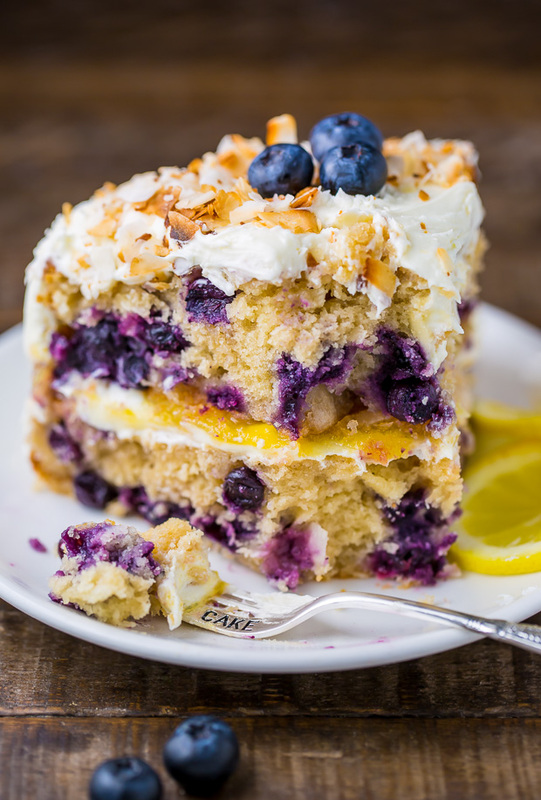 This luscious Lemon Coconut Blueberry Cake is bursting with flavor and beauty! It’s the perfect layer cake for Spring holidays like Easter and Mother’s Day! Hiiiiiii! How are you? It feels like forever since we’ve talked! Even though in reality it’s only been a few days. I know it’s been a little quiet around here… but I promise, I’ve been baking my heart out on this end. I spent the past week creating 5 new recipes for you. I even took step-by-step photos because I know you love them so much! Coconut is one of the best flavors to bake with, don’t you think? It’s bright, nutty, and exotic. You can incorporate it into baking in so many different ways! There’s coconut milk, coconut oil, coconut cream, coconut flakes… you get the picture! For this cake, I wanted a subtle coconut flavor, so I used coconut oil, coconut milk, and toasted coconut flakes. I tested this cake a few times before I got the measurements just right, so I highly suggest sticking to the recipe exactly as it’s written. Originally I had planned to add toasted coconut flakes into the actual cake layers, but in the end I found the texture to be kind of clumpy and overall not very enjoyable. I still wanted to incorporate the toasted coconut flakes somehow, and found that using them to coat the frosting added incredible flavor, texture, and beauty to the cake! WIN. In addition to the lovely coconut flavor, this cake boasts subtle hints of lemon and vanilla. 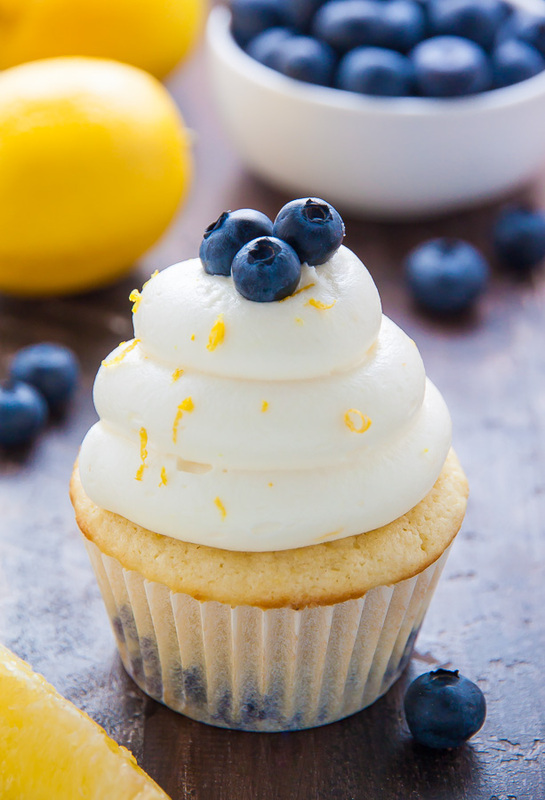 It’s also bursting with juicy blueberries and coated in a lemon coconut cream cheese frosting! 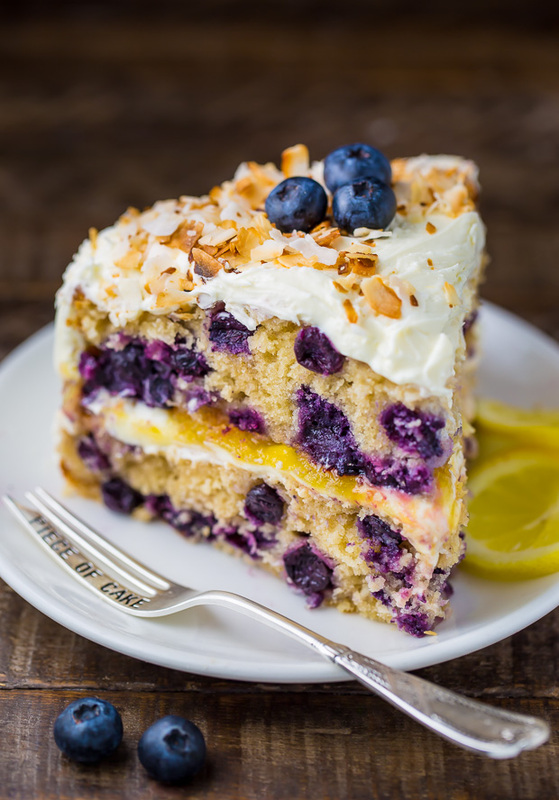 I know it’s a little early for grand proclamations… but I’m calling this Lemon Coconut Blueberry Cake the “It Girl” of the Spring season. It just has it going on! This recipe calls for cake flour. Cake flour is extra finely ground and gives this cake its silky soft texture. In most grocery stores you can find cake flour in the baking aisle. If you can’t find it – don’t fret! Making your own cake flour is easy, and only requires two ingredients: cornstarch and all-purpose flour. Here’s what you do: For every 1 cup of flour called for in the recipe, remove 2 Tbsp of flour. Then add in 2 Tbsp of Cornstarch for every 1 cup of flour (you’re replacing the tablespoons of flour taken out with cornstarch). Sift this mixture a few times (you want it well combined) and that’s it – you just made ready-to-use cake flour. When you measure your flour, be sure you’re not packing it into the measuring cup. Packed flour will yield a dense and heavy cake. 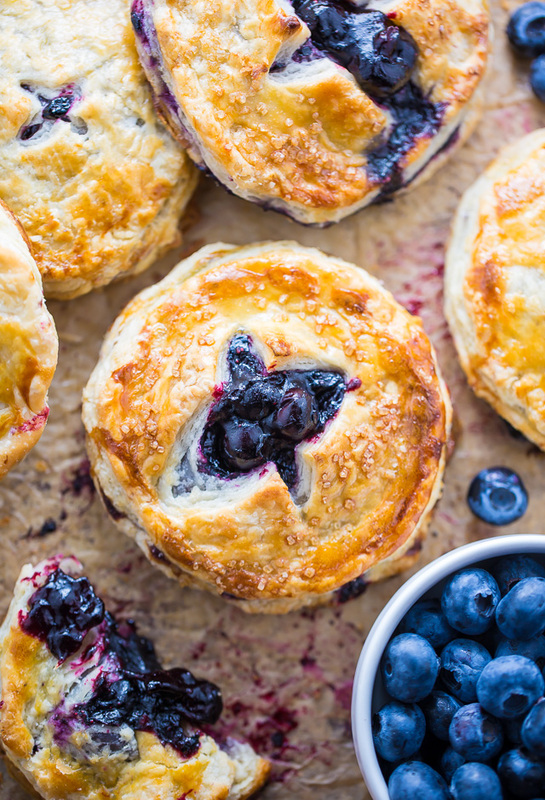 Be sure to toss the blueberries in all-purpose flour before adding them to the batter. This dusting of flour helps keep the berries afloat during the baking process, and ensures you won’t slice into a cake full of sunken berries. 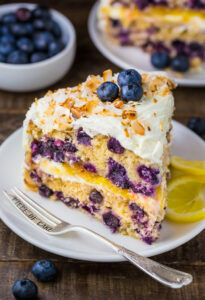 You may use fresh or frozen blueberries for this cake. If you use frozen, don’t thaw them first. I used store bought lemon curd in this recipe, but feel free to use homemade if you’d like! You can find my favorite lemon curd here. Use fresh lemon juice and zest! You’ll want to zest the lemons first, then cut them in half and juice them. I suggest buying 6 or 7 large, heavy lemons so you have enough on hand. For the lemon extract, I love Watkins pure lemon extract because it’s 100% natural, doesn’t contain any artificial flavors, colors, or additives, and just tastes like pure lemon. I promise I’m not getting paid a cent to say any of that; I just really love their lemon extract! For best results make sure your butter, eggs, sour cream, and milk have all come to room temperature before you begin baking. 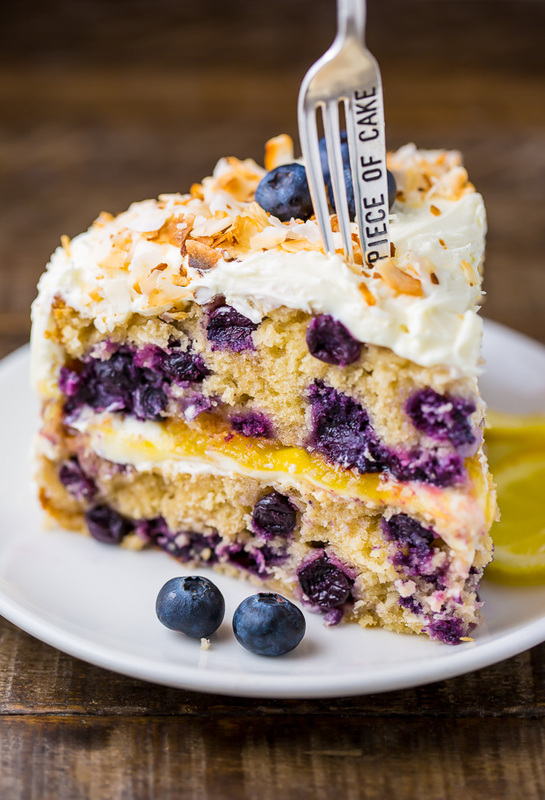 If you’d like your Lemon Blueberry Coconut Cake to look exactly like mine does in these photos, simply top it with fresh blueberries, toasted coconut flakes, and twisted lemon slices. There is a difference between coconut milk and coconut cream, so be sure you read the label when you’re picking it up at the store. You want pure unsweetened coconut milk. ↑ I know that was a TON of reading, but I want your cake to be absolutely incredible! And those tips ensure it will be, my friend 😉 If there’s anything I missed, just let me know how I can help in the comments below. 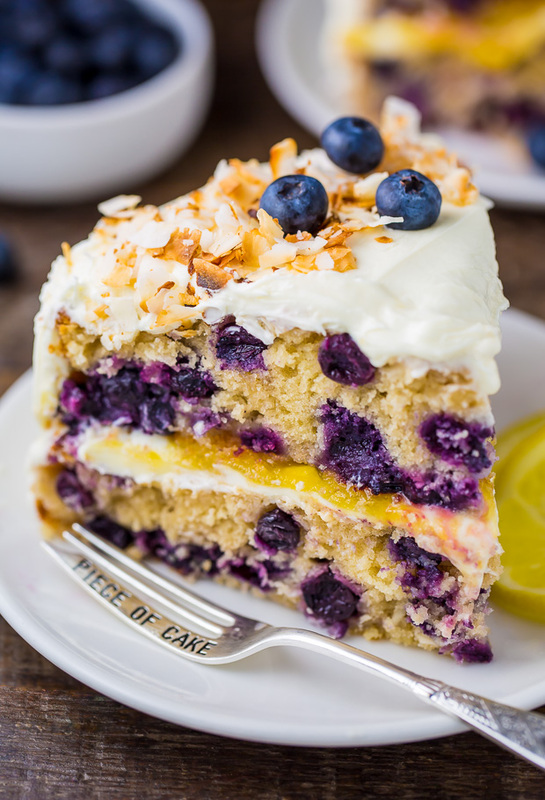 This luscious Lemon Coconut Blueberry Cake is bursting with flavor and beauty! 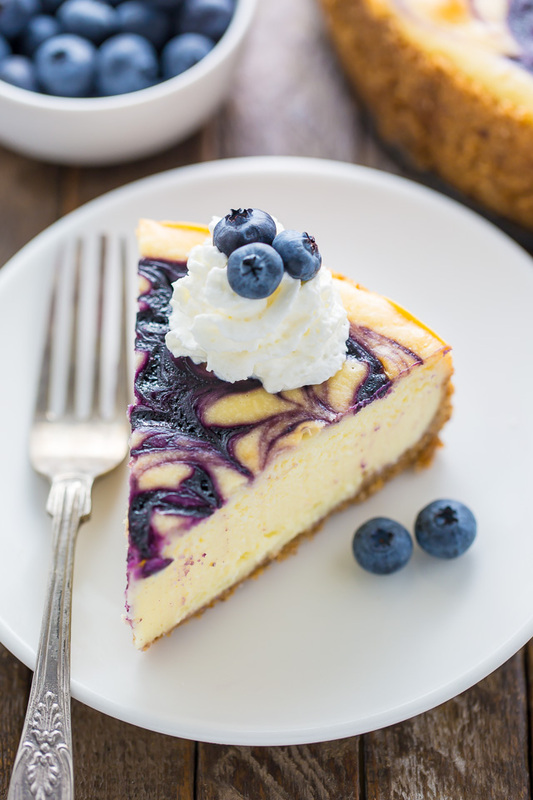 In a large bowl using a handheld electric mixer, or in the bowl of a stand mixer fitted with the paddle attachment, combine the butter, both sugars, lemon zest, lemon extract, and vanilla extract; beat on medium speed until light and fluffy, about 5 minutes (don't skimp on time here!). Add in the eggs, one at a time, beating well after each addition, and scraping down the sides of the bowl as needed. Set aside. In a medium-sized bowl, whisk together the cake flour, baking powder, baking soda and salt, mixing well to evenly combine the ingredients; set aside. In a separate bowl combine the sour cream, coconut milk, lemon juice, and coconut oil; whisk well and set aside. Add the cake flour mixture into the butter mixture and beat on the lowest speed until everything is just barely combined, about 20 seconds. You should still see some lumps and dry streaks. Turn mixer off. Add in the liquid mixture and, using a rubber spatula, fold the ingredients into the batter, mixing until everything is incorporated, but being sure not to over mix. Set aside. 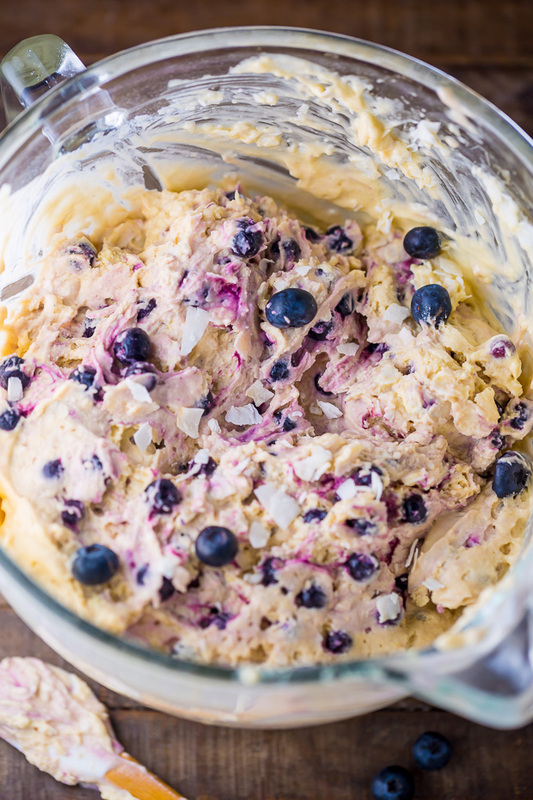 In a separate bowl, combine the blueberries with 1 and 1/2 tablespoons of flour; toss to coat. Add the blueberries and any remaining flour to the batter and fold in by hand, using a rubber spatula, until just combined. Again, be sure not to over mix! Over mixing is very easy to do, and will result in a dry, dense cake. Divide the batter evenly among the prepared pans and bake for about 33 minutes, or until the tops are firm and slightly golden, and a cake tester (or toothpick) inserted in the center comes out clean, or with a few moist (but not wet) crumbs clinging to it. Allow the cakes to cool in the pans for 5 minutes before gently running a knife around the edges to loosen any stuck bits, then turning them out onto a cooling rack to cool completely. While the cakes cool, you can make the frosting. In a large bowl using a handheld electric mixer, or in the bowl of a stand mixer fitted with the paddle attachment, beat the cream cheese and butter on medium-speed until light and fluffy, about 3 minutes. Reduce the speed to low, then add in the confectioners' sugar, lemon zest, lemon juice, lemon extract, and salt; beat until combined. Increase the speed back to medium and mix until creamy, about 2 minutes. Add the coconut milk and continue beating the frosting until very light and fluffy, about 2-3 minutes. If the frosting seems too thin, add a little more confectioners' sugar, starting with one tablespoon at a time; if the frosting seems too thick, add in a little more coconut milk, starting one tablespoon at a time. Once the cakes have completely cooled, place one round on a cake stand or large plate; spread the top and sides evenly with frosting, then top with the lemon curd. Don't worry if they mix together a little. Gently place the other cake round on top of the frosted one and press down very lightly to seal them together. Continue frosting the cake, using a thin spatula, offset spatula, or whatever you have that works best, until the top and sides of the cake are evenly frosted. 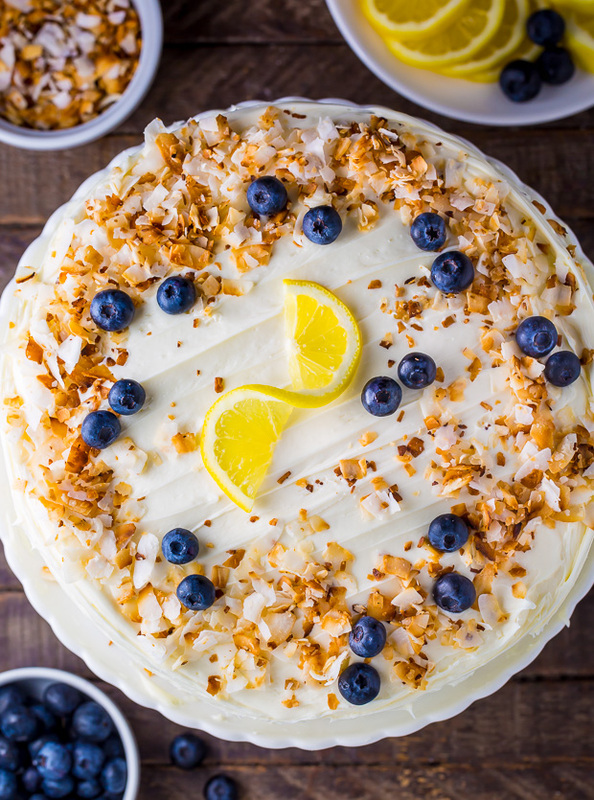 Press the toasted coconut around the sides of the cake, pressing it lightly into the frosting, then decorate the top with more coconut flakes, fresh blueberries and lemon slices. The frosted cake will stay fresh, when covered and stored in the refrigerator, for 48 hours. Simply take it out of the fridge an hour or two before serving so it can come to room temperature. My boyfriend also loves this cake cold, so feel free to try it chilled! For best results, follow recipe exactly as written! If you find anything in the recipe confusing, please see the "Tips and Tricks" section in the post. Cake will stay fresh, covered and stored in the fridge, for 48 hours. Where do you put the 4large eggs you have mentioned in the ingredients for the cake? Just made this and it was a HUGE hit with my family and friends. One thing, however, the frozen blueberries sank even though they were left frozen and floured as instructed. Should I just make sure to use fresh, or is there another trick with the frozen blueberries? Hi Elaine! I’m so happy this cake was a hit 🙂 Sometimes no matter what we do the blueberries sink… especially if they’re big ones. I have made it today and my family liked it very much. One of the ingredients was missing, coconut oil and added vegetable oil instead. It worked:)) The cake was very very delicious but I prefer less sugar in my creams so used patisserie cream instead of buttercream. This cake looks absolutely amazing! Hi Ashley, this cake looks so good I wanna make it for my son is birthday! But he is allergic to eggs. Is it possible to substitute the eggs with something else? Do you think this cake could be done in a bundt cake? This recipe looks soooooo good! I was wondering for the coconut milk, do you only use the cream at the top of the can, or do you mix the coconut water at the bottom of the can with the cream? Thanks! This recipe looks soooo good! I was wondering for the coconut milk if you only use the cream at the top of the can or do you mix the coconut water at the bottom of the can with the cream? Thanks! I followed the recipe exactly but I’m worried because the mixture was more like pancake batter than thick as your photo shows. Can I use the lemon coconut blueberry cake for a wedding cake covered with fondant… Im just scared the cake might sag with the heavy fondant… and you say it stay good only for 48 hours in fridge….